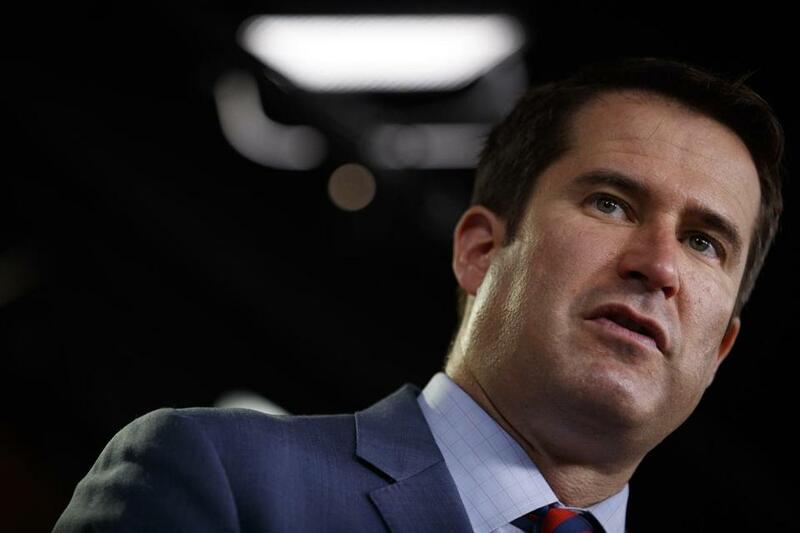 US Representative Seth Moulton, a Marine veteran entering his third term, has argued that Democrats need new leaders to reflect a new party. US Representative Seth Moulton burst onto the Massachusetts political scene in 2014 by pursuing what few Democrats had openly considered: challenging, and beating, one of his own. But four years later, that same willingness to buck the top echelon of the party is stirring calls for Moulton to face his own primary challenge, potentially drawing the Salem Democrat into a fight his own supporters say shouldn’t be dismissed. Moulton’s boisterous challenge of Nancy Pelosi as the next speaker of the House is at the center of the discontent in the Sixth Congressional District, where activists say they are not only raising money to fund a potential primary challenger but are convinced Moulton, should he seek reelection in 2020, will be opposed within his own party. “There is definitely enough energy that there will be a primary challenger. It will just be a matter of when that person, or what person, will announce,” said Isa Leshko, a Salem Democrat who helped organize pro-Pelosi protesters at one of Moulton’s town hall meetings last month and has criticized him for dividing the party as Democrats prepare to take control of the House. “He needs to recognize that there’s a lot at stake at this point beyond his ego,” she said. Leshko said she is exploring launching a political action committee to back a Moulton challenger and is in discussions with a national progressive group, which she declined to identify, to funnel the support toward whichever candidate it endorses. Others have likewise attacked Moulton for criticizing Pelosi, the highest-ranking woman in the Democratic party, helping fuel a push for a woman to challenge him. And others could still pounce at the seat should Moulton — long-discussed as a potential challenger to Senator Edward J. Markey — decide to pursue higher office. Moulton has said he has no plans to challenge Markey. “Calling for the replacement of the woman who’s widely expected to be the next speaker without an alternative or a real reason probably wasn’t the most productive thing to do,” said state Representative Lori A. Ehrlich, a Marblehead Democrat who said she’s focused on starting her seventh term in the State House this January but is “curious” to see whether Moulton forgoes reelection. The efforts to replace Moulton, however, have underscored both the scrutiny he’s invited in the North Shore-anchored district, and what some say is an ironic twist to his ascension in politics. In publicly rebuking Pelosi, the 40-year-old is displaying the same willingness to challenge established Democrats that helped win over voters in 2014 when he toppled then-Representative John F. Tierney. That victory made Moulton the first Massachusetts Democrat in 22 years to unseat an incumbent congressman from his own party. “I can tell you with certainty, Seth Moulton is not afraid of democracy,” said Scott Ferson, who advised Moulton in 2014 and still keeps in regular contact with him. But Ferson also noted that after a year when women won in record numbers, a primary opponent can’t be dismissed. “I think every elected male should be concerned about a female challenger in 2020,” he said. An aide said Moulton was unavailable for interview Tuesday. But Matt Corridoni, a spokesman, sought to tamp down the impact of Moulton’s opposition to Pelosi, noting that his calls for new leadership date back more than a year and that Moulton still won soundly over a Republican opponent last month. “Challenging the status quo and taking on the establishment is always met with resistance from those in power, but the American people — and Seth as one of their representatives — know it’s the right thing to do,” Corridoni said. Of course, plotting Moulton’s political future is a popular parlor game in Massachusetts political circles. Should Moulton opt against reelection, an open Democratic primary could suddenly be rich with potential entrants. Dan Koh, who finished second in the Third District’s 10-Democrat primary, could seek the seat, given the Sixth District’s overlap into his hometown of Andover. Koh declined to comment Tuesday. David Guarino, a Democratic campaign strategist who lives in Salem, said despite the rumblings against Moulton, there are those in the North Shore city who aren’t surprised by the tack he’s taken with Pelosi. There may be frustration, but Guarino said he’s not convinced it’s suddenly made Moulton vulnerable, too.